It is pretty common for Outlook 2013 users to have the email program open on their desktop or laptop computer while they perform other tasks. Outlook can check for emails at any frequency that you would like, and those messages will automatically be delivered to your inbox. 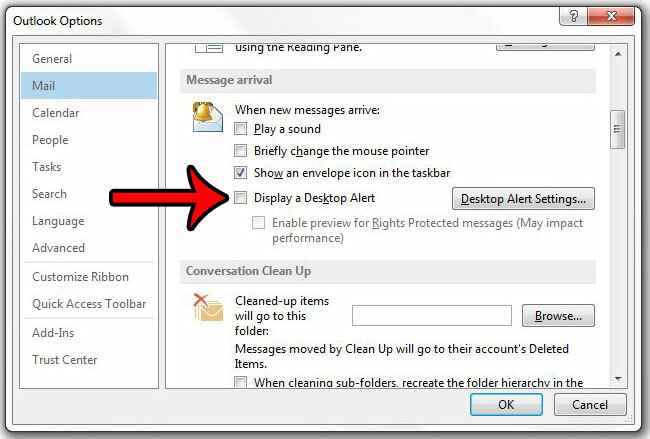 You can tell that you have received a new message by the presence of an envelope on the Outlook taskbar icon, by a notification sound, by a brief change to the mouse pointer, or via a blue pop-up notification box called a Desktop Alert. Any of these options can be helpful but, depending upon how you use your computer, you may find that you are accidentally clicking the blue notification window when it pops up. 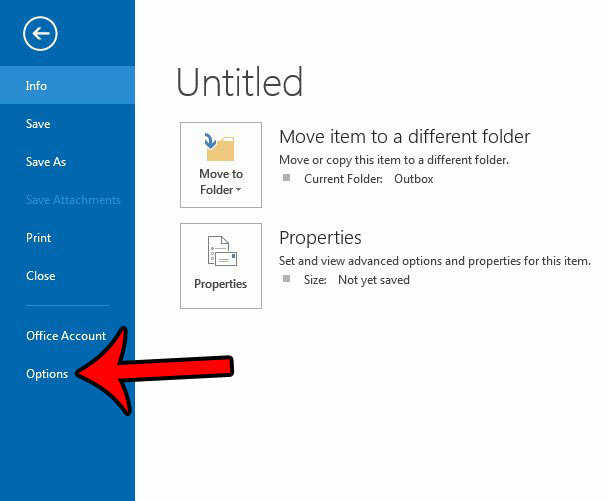 Our guide below will show you how to adjust the Outlook 2013 notification settings so that the blue pop-up box no longer appears when you receive a new message. 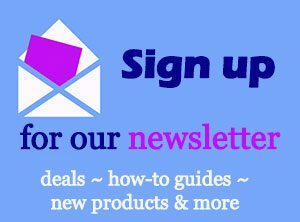 Click the Mail tab at the left side of the pop-up window. Uncheck the box to the left of Display a Desktop Alert in the Message arrival section of the window. Click the OK button when you are done. 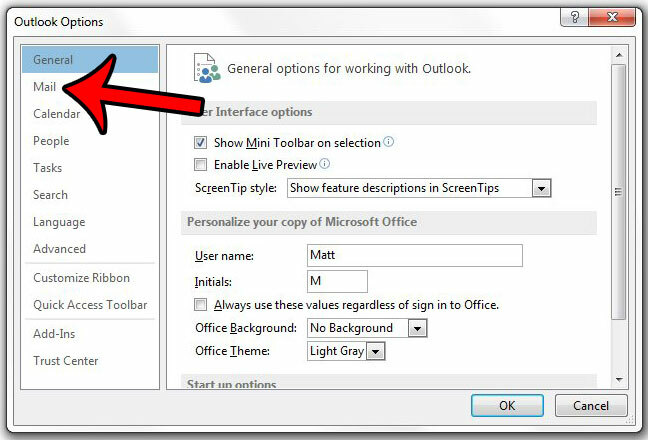 Step 2: Click the File tab at the top-left corner of the Outlook 2013 window. Step 2: Click Options at the bottom of the column on the left side of the window. This opens a new window called Outlook Options. 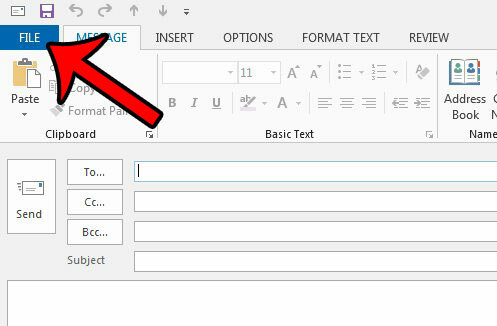 Step 3: Click Mail in the column at the left side of the Outlook Options window. 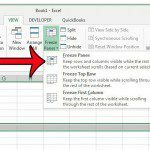 Step 4: Scroll down to the Message arrival section of the window, click the box to the left of Display a Desktop Alert to clear the check mark, then click the OK button to apply your changes and close the window. 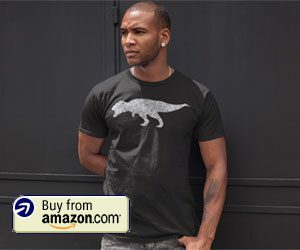 Is there an email that you need to send, but would prefer to send it at a time when you may not be in front of your computer? Learn how to send a future email in Outlook 2013 by using the Delay delivery feature. 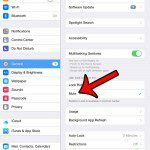 Why Can’t I Lock the iPad Screen Rotation from the Control Center?